Kitchens, bathrooms, common rooms and floors are cleaned by the cleaning staff once a week (not including the single rooms). The VAÖ dormitory provides 3 small apartments. 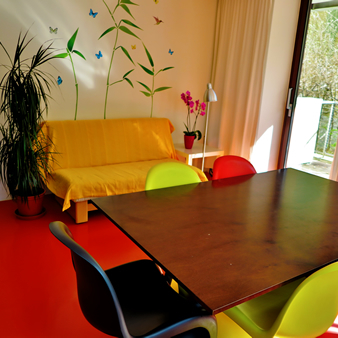 These apartments consist of a kitchen with a comfortable common area and two rooms of 10 m² and a balcony each. The bathrooms and toilets in these studios are handicapped accessible. These prices are valid in the academic year 2019/2020 and include electricity and running costs. Internet connection is available in each room, both with cable and wireless internet throughout the house. Furthermore it is possible to rent bed-linen and dishes for 20€ each per month!